Big and majestic when walking slowly on ground. Huge in flight; shape resembles White Stork (though slightly bigger and shorter-billed), but grey plumage contrasting with black flight-feathers, black head and upper neck, and white stripe from eye down along neck, are obvious features. Red band above eye visible only at closer range. Looks ‘bushy’ at rear on ground. Juvenile has brownish head without contrasting head pattern. 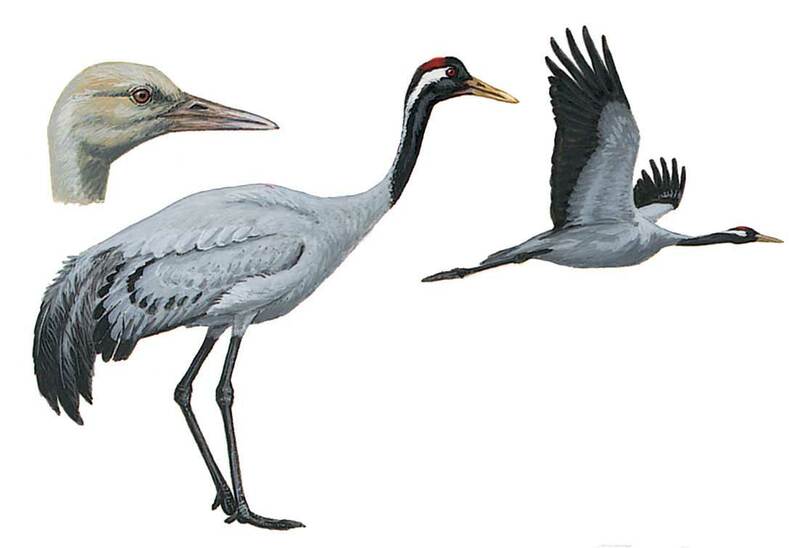 Adult separated from herons by size and projecting neck in flight. Flight action regular and powerful interspersed with long glides and soaring; often in ‘V’-formation or lines.